The best of the best archers are chosen for this role, to serve the Imam with skill and prowess. These sharpshooters are able to fire their arrows through ranks of soldiers and can stop charging cavalry. 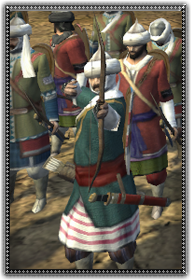 Armed with strong bows, made in the traditional fashion, and Kattara, they make for a very versatile unit able to fight in melee or fire upon their foes from afar.